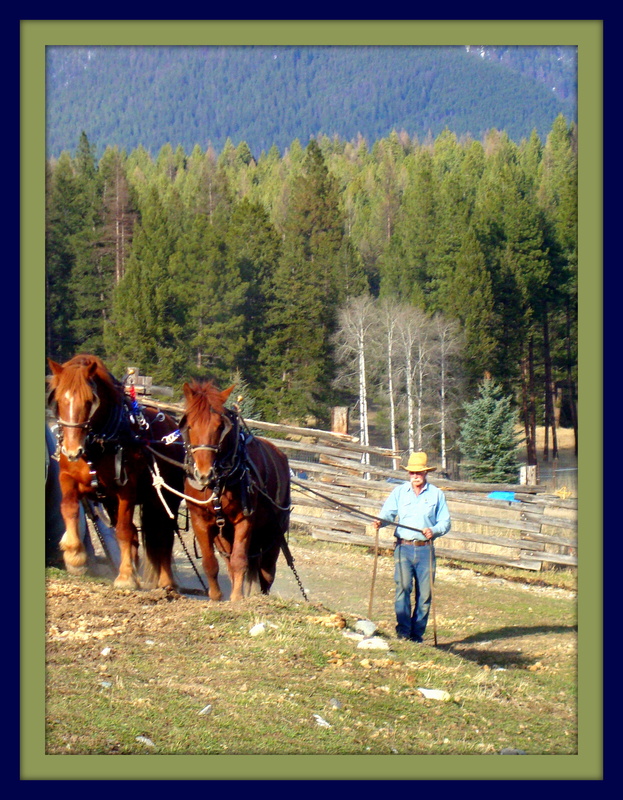 The Montana Draft Horse and Mule Association has selected 2012 inductees into the Montana Draft Horse and Mule Association Teamster Hall of Fame. 2012 Inductees are Jim and Donna Norgaard of Roy, Rusty and Margaret Hebel of Dillon, and Doc Hammill of Eureka, Montana. The draft animal era in America dates from the mid-1800s to the 1930s when expansion and industrialization depended on horses, mules, oxen, and the teamsters who drove them. The majority of people who use our modern highways and are served by railroads may not realize that draft animals were used to build early transportation systems. Draft animals served our nation in many ways in the past. The use of draft animals has not entirely ended. Indeed, while many think the use of draft horses, mules and oxen is novel, there has been increasing use in recent years. Without individuals, such as those honored by the Montana Draft Teamster Hall of Fame, skills needed to use draft animals would be difficult to obtain. The Montana Draft Teamster Hall of Fame is dedicated to those individuals that have made significant contributions to the preservation and dissemination of knowledge, education, and use of draft animals and or draft equipment for work or pleasure in Montana. Induction into the Montana Draft Teamster Hall of Fame is based on an outstanding record of contributions to teamster education, preservation and use of draft animals or restoration of equipment used by draft animals. The Class of 2012 Hall of Fame Inductees are Jim and Donna Norgaard of Roy, Rusty and Margaret Hebel of Dillon and “Doc” Hammill of Eureka, Montana. Doug “Doc” Hammill has many, many years of experience with horses in harness. “Doc” often tells students about how he, as a youngster of 7, decided to hitch and drive his pony. He recollects that he nailed ‘shafts’ (two small pieces of lumber about the right size) onto a two wheeled cart. He fashioned a harness of found objects, including leather straps and bailing twine, and secured the pony to the cart. Using more twine for lines, he jumped on the cart-Ben Hur style and drove off…..never bothering to check to see if the pony had ever been trained to drive. He countered much of what he learned the hard way as a youth, by seeking out good older teamsters to spend time with when he moved to Montana as a young veterinarian in the ‘60s. 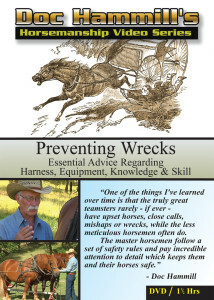 Doc often credits his many good teamster mentors with really teaching him to drive and work with horses in harness. Over time Doc, a well-respected veterinarian, acquired his first team of Clydesdales and a piece of ground. There, he raised many colts, farmed his eighty acres near Creston, Montana, using horse drawn plows, discs, rakes, harrows, mowers, balers, drills, and combines, wagons and carts pulled by his Clydesdales and mules. Throughout, his learning process, Doc has taken what he has learned from research, his own trials, and his mentors, and has created his own style of horsemanship; he calls it “Gentle Horsemanship”. 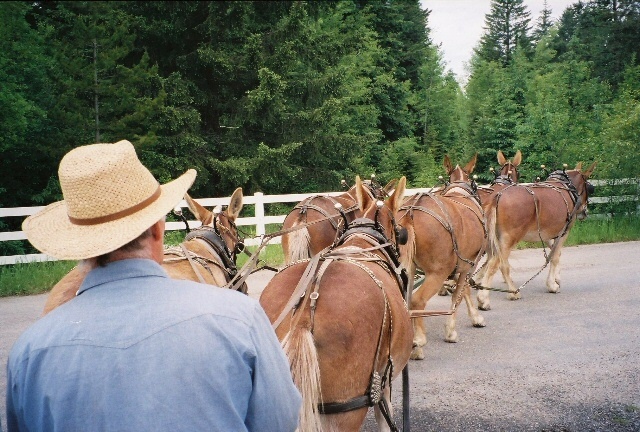 Doc created of “Old West Adventures” and as owner/operator for over ten years, he treated thousands of customers to wagon and sleigh rides pulled by his Clydesdales at Big Mountain in Whitefish, Montana. He also organized and participated in authentic wagon trips in Montana, some for pleasure, some commercial, with horse drawn wagons pulled by hitches of two and four horses or mules. First at his remote Hard Trigger Ranch near East Glacier, Montana and more recently at Therriault Creek Ranch near Eureka, Montana, students come from all over the US, Canada, some traveling from Europe and Australia to learn driving skills and how to work with horses from Doc. Students of “Doc Hammill Horsemanship” number in the thousands. He regularly travels to other locations in the US and Canada to do Driving and Working Horses in Harness Workshops. 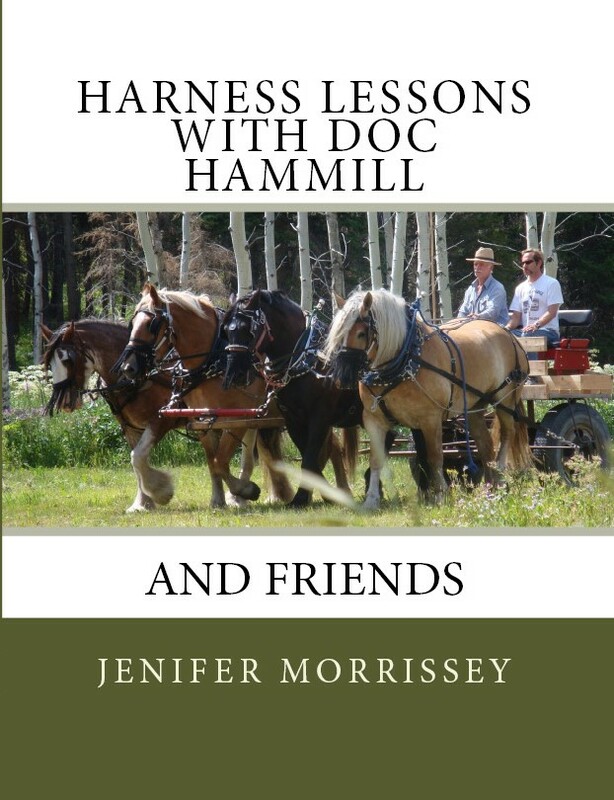 He has dedicated his life to bringing “gentle horsemanship” (his term for natural horsemanship) to people and especially the draft horse and mule world through workshops and clinics, written words and educational DVDs. Doc has written a draft horse driving column, “Ask a Teamster,” in The Small Farmers Journal for more than 15 years, as well as a regular contributor to Rural Heritage Magazine. He is a frequent presenter at Horse Progress Days and other draft horse events around the country. 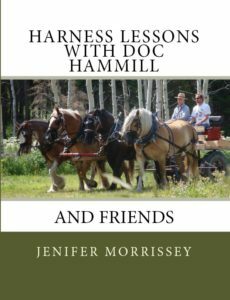 Doc has produced several educational DVDs, featuring his gentle horsemanship techniques that have helped many, many people learn to drive and work with horses. Doc on Rural Heritage’s TV program on RFD TV ! This is EXCITING! What is Rural Heritage Showing on RFD-TV? Preventing Wrecks Part 1 (New) – Doc Hammill provides essential advice and rules to follow to prevent accidents. February 3, 2012! Check your local listings for times. And, on RFD TV: Rural Heritage’s Hour on February 17, 2012: Preventing Wrecks Part 2 (New) – Doc Hammill provides additional advice and rules for avoiding mishaps. Preventing Wrecks — Learn how to prevent common wrecks with horses in harness from a respected master horseman. Get Doc’s Essential Safety Advice regarding Harness, Equipment, Knowledge and Skill. 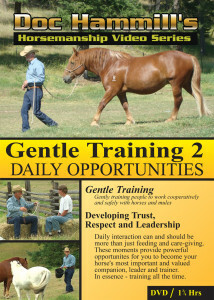 Gentle Training 2: Daily Opportunities — Daily interaction can and should be more than just feeding and care giving. These moments provide powerful opportunities for you to become your horse’s most important and valued companion, leader and trainer. In essence-training all the time. Tom Triplet, my step father, was inducted into the Montana Draft Teamster Hall of Fame at the 13th annual Big Sky Draft Horse Expo in Deer Lodge, Montana. Tom comes from a family of horsemen, dating back to the days when Tripletts were friends and neighbors of George Washington, and his ancestors took Washington’s guests fox hunting and did the future president’s carpentry work. His parents moved from Missouri to Oklahoma in horse drawn wagons before his birth, then back to Missouri and later on to Montana. Four years before Tom was born they moved in wagons from Plentywood Montana to the Flathead Valley, west of the Continental Divide. For Tom, horsepower was the only source of transportation and power into his early adult years. He logged with horses, worked mules in the forest service grading landing strips, skidding poles, putting up hay and more. Triplett’s depth of knowledge, experience and patience, his commitment to safety and the comfort and the well being of the animals, and his obsession with figuring how to get everything “jeeest right”- which all combined, puts him in a class of his own among horsemen. I’m doing a 2-day free demonstration at the Grant-Kohrs Ranch National Historic site Deer Lodge MT. Sept 17 & 18. I’ll be starting two young horses to drive using the techniques in my gentle training in the RP video and my teaching horses to drive video.